This year's Hangout Music Festival has quite the lineup. With artists ranging from Travis Scott to Vampire Weekend, Bazzi to Hozier, and The Lumineers to Diplo—it's definitely set to be an unforgettable festival. One thing I couldn't help but notice? The fact that even though there are over 60 artists performing at the festival, only about a measly 18 of them, including co-ed performance groups, are female. This isn't just a Hangout Fest problem. It's a reoccurring issue throughout other popular music festivals like Coachella, Ultra, and iii Points. There are tons of great female artists out there just waiting to share their music with festival-goers around the world... it's about time they stopped waiting. That being said, it's basically my civic duty to hype up some of my favorite female performers from the festival lineup who all deserve a bit more love and attention at this year's Hangout Music Festival. After an incredible Grammy’s performance and the release of her latest chart-topper "Please Me" featuring Bruno Mars, Cardi B is ready to grace the stage of Hangout Music Festival with her unmatchable stage presence and charm. The rapper will be one of the headlining acts at the festival along with popular artists such as Travis Scott, Diplo, Khalid, Vampire Weekend, and The 1975. If for any reason you've never heard a single Cardi song, some of her most famous tracks include: "Bodak Yellow," "Be Careful," and "I Like It." Best known for her tracks "I'm A Mess," "In the Name of Love," and her most recent release, "Last Hurrah," Bebe Rexha has definitely made a name for herself in the pop industry after her career took off around 2016, though she's been writing songs for artists like Rihanna, Selena Gomez, and David Guetta since 2013. 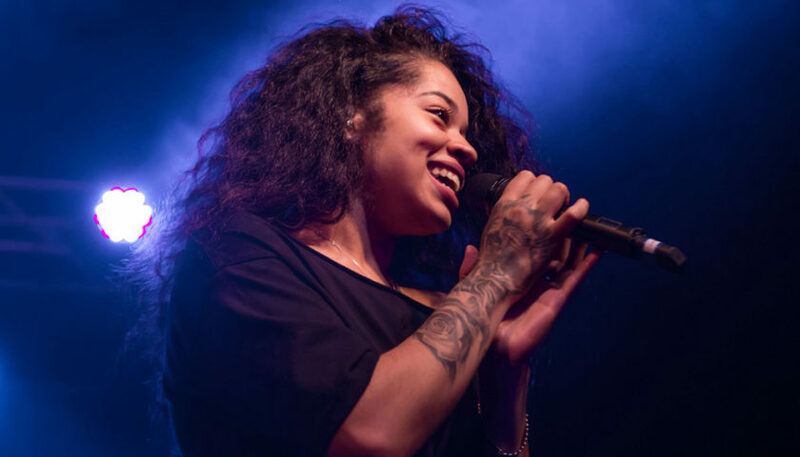 Emerging from the R&B scene, Ella Mai is well-known for her track titled "Boo'd Up," which earned her two Grammy nominations this year for Best R&B Song (which she won) and Song of the Year. Some other popular songs of the "pure '90's R&B heartthrob" that are definitely worth the listen are "Trip," "Shot Clock," and "Whatchamacallit." A fresh-faced singer with a retro sound, Ravyn Lenae brings a new vibe to the festival with songs like "Sticky," "Free Room," and "4 Leaf Clover." Though the R&B singer—who only just turned 20 this year—is still considerably new to the music world, she was named one of the "10 Artists You Need to Know" by Rolling Stone and opened for SZA on her Ctrl Tour. It's only a matter of time before her music floods your favorite Spotify playlists and her songs make the top charts. Last but not least, Elley Duhé is still considered a rookie to the pop industry. With a melodic voice and unique sound, she has made her way to the radio with her features on Zedd's "Happy Now" and Gryffin's "Tie Me Down." Some of her top tracks include: "FEVER," "immortal," and "$$$$." For more artists from the lineup and information regarding the festival, visit Hangout Music Festival’s official page! And be sure to come hang out with Her Campus UCF on March 5 from 6:00–8:00 p.m. We’re teaming up with Hangout Music Fest to bring a little spring break right to our campus, featuring music trivia, beach games, festival makeovers, and of course plenty of beachy photo ops! We can’t wait to see you there! Elizabeth, currently majoring in Journalism, is a freshman at the University of Central Florida. Writing, reading, and dancing are a few of her passions. She especially loves discussing all things music and entertainment, mental health, and self-empowerment. If you're curious to see what Elizabeth's up to, follow her on Instagram @xelizvbeth!